Running a franchise, or business with multiple locations, can pose a unique risk from a digital marketing perspective. It’s a challenge to present a clear, consistent message for the brand while also giving individual owners and managers the freedom to make their own decisions. Our clients had given individual owners a lot of leeway in the past, but that was increasingly becoming a problem. Disagreement between franchise owners were becoming more frequent due to each running different promotions, and corporate didn’t have rules in place to control overall messaging. It was time to take a hard look at the digital marketing program, get organized, and manage central campaigns to enhance performance and standardize messaging. We creative a strategic plan based on performance data and insights from key individuals in the company that brought all the Google Ads campaigns under one umbrella, implemented the most successful strategies, and tracked results in a more meaningful and effective way. In addition to solving organizational problems, the campaigns themselves resulted in almost immediate cost/conversions decreases of over 40% and lead volume increases 20%. With continued optimization, landing page testing, and scaling, we are excited to continue to improve results and help the company expand. A multiple location business came to us concerned about inconsistent messaging and varying performance across all their independently operated locations (image 1). Owners and operators of different franchises were using different messaging and promotions, often in the same market (image 2), and were employing varying degrees of competency for management. This was causing conflicts in communications, creating problems between locations. Management wanted to fix that. Organization and standardization of digital marketing campaigns across all of their locations was imperative. This would allow for more efficient and cost-effective management and promotion of their business across all locations. Pricing and promotion confusion among customers would be reduced or eliminated. Locations needed to work together to build the brand. We started addressing the problem by speaking with management about their objectives, as well as individual franchise owners to discover what their goals were from their personal campaigns. Our focus was to marry these goals, learning what we could from all the individual location campaigns and then applying those learnings to create more a holistic approach for the company as a whole. Using analytics data and Google Ads campaign data, we wanted to analyze what was successful and what wasn’t from previous campaigns. 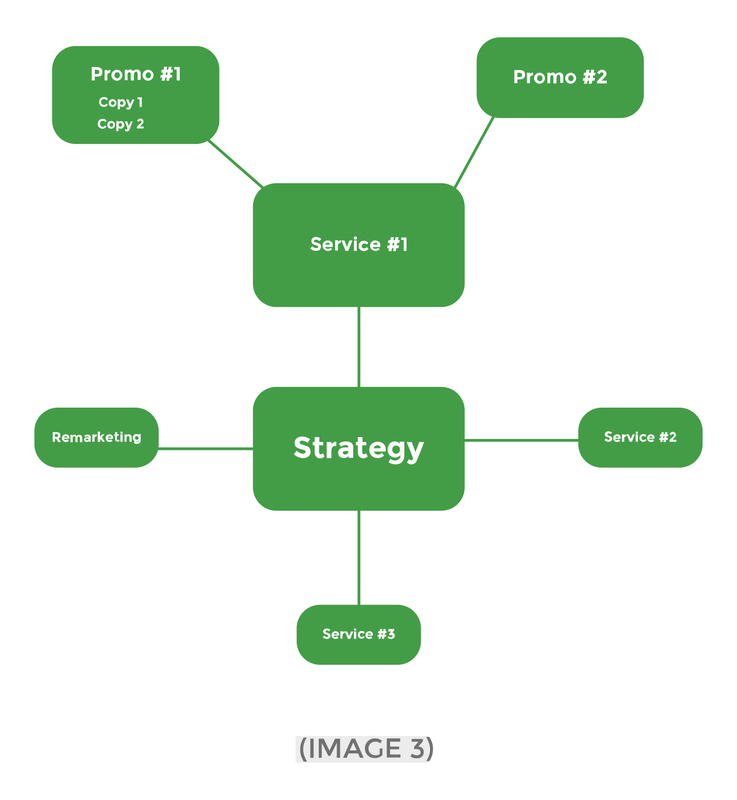 Combining that with internal sales data, we could create a picture of what was and wasn’t successful, and then use internal data, ad copy, and targeting information to determine why that might be (image 3). 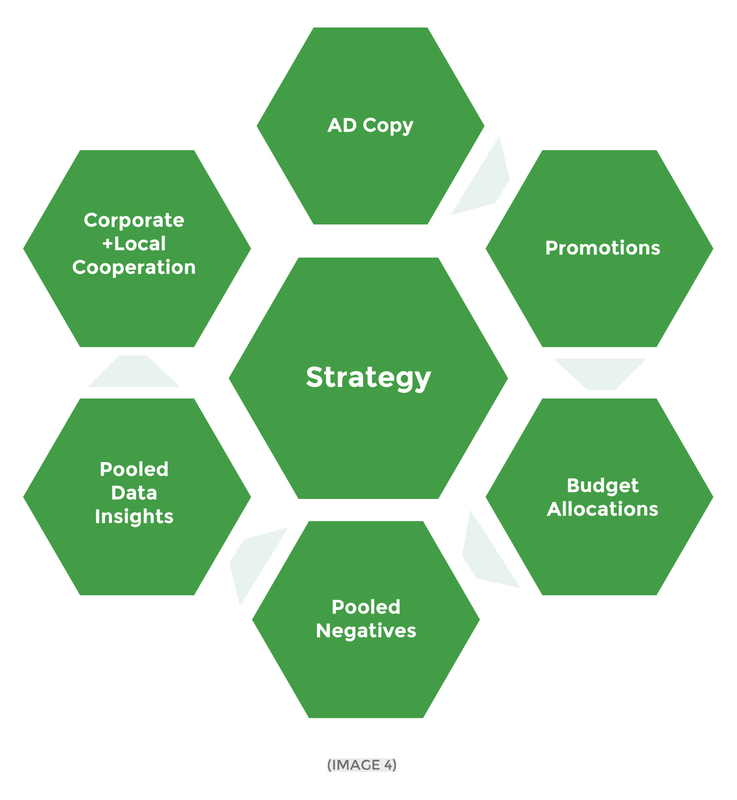 In the end, we wanted to present standardized tactics and campaigns to optimize the effectiveness for each location while maintaining central control over important business metrics. We started by speaking with individual locations about how they were running their campaigns and why. What promotions they found to be effective. Which kinds of leads lead to larger sales, or higher conversion rates after a lead came through. The demographics, interests, and locations of most of their customers. We wanted to get an effective qualitative understanding of what happened after a lead came through and how business owners approached their marketing so we didn’t overlook anything when just crunching numbers. All the individual advertising accounts for each location were maintained, but brought under one management umbrella. Individual owners still had access, and reports were created to help them benchmark and see results. Corporate and individual franchise budgets were combined for simplicity (and to stop driving their own prices up). Once the performance data on all the accounts was fully analyzed, we created flexible, scalable campaigns that were standardized but easily manipulated for the marketing preferences of individual business owners. They could provide priorities on locations to target, which services to advertise, and how budgets would be distributed. This freedom was provided, but corporate was also able to control messaging and make sure promotions were consistent. Managing all the accounts under one umbrella, we were able to pool data and recognize trends faster. More negative keywords could be applied to all the accounts at faster rates. Meanwhile, we maintained some individualism in each account so owners could still promote with a lot of freedom (image 4). With the implementation of new campaigns, fighting among location owners about promotions and pricing came to a halt. Corporate had more control over margins. Promotions and discounts could be planned ahead of time and launched at all locations simultaneously and with consistent messaging. Not only did results improve from an organizational standpoint, but results as well. Cost/conversion decreased for every single location on major call and form fill KPI’s. Our ability to reorganize and implement an improved structure, optimize bids, and use winning ads and promotions across all accounts resulted in decreased cost/conversions between 15%-200%. Many locations were able to increase spending and scale leads as the result of better targeting and lower costs/lead. Additional locations and new locations were also able to easily and efficiently launch new accounts as well. With the use of running accounts, we were able to immediately launch successful campaigns for these locations, skipping a lot of initial hurdles new accounts sometimes face. 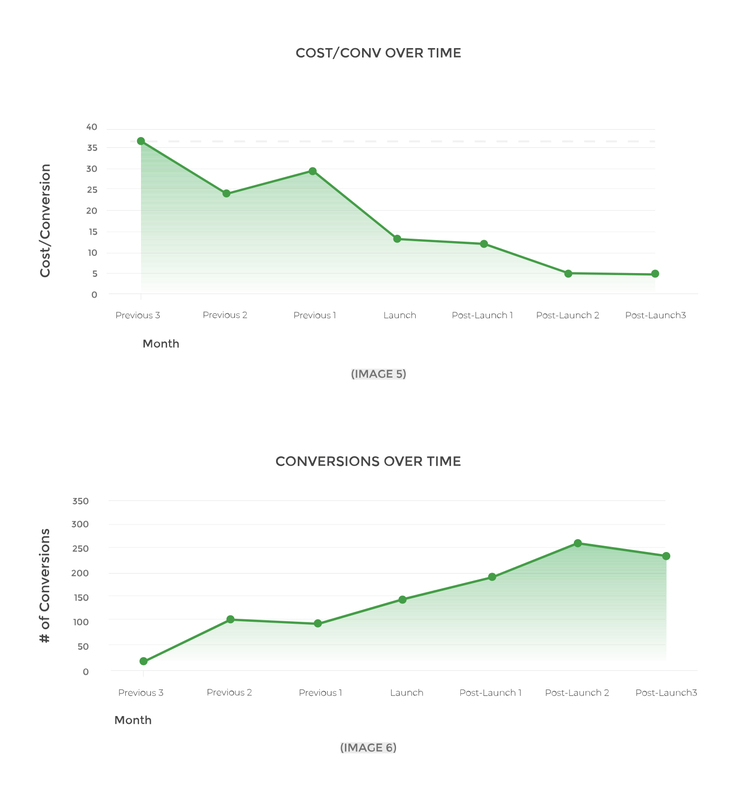 Overall, cost/conversions decreased by over 40% (image 5) and volume increased 25% (image 6). We continue to help them scale and manage campaigns, are starting to test and develop new landing pages based on successful promotions, and providing the tools to help take their corporate marketing effort to the next level as a whole.